A very good and healthy diet every day is essential to supply enough nutrients to our organs including the brain. The brain is our center for body management, development, and memory keeper. A healthy brain is a leading way for your body to be functioning correctly. 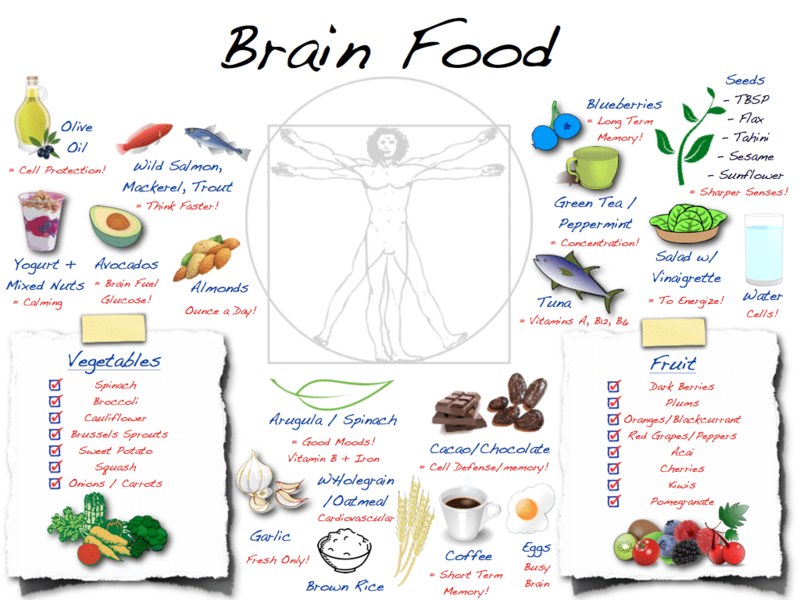 Do you know the best brain foods to keep your brain healthy and happy? Here are 8 foods that you should keep yourself near with for the brain’s health. Wholegrain provide the energy to your brain, so the brain can work and functioning normally. Without energy, your brain will be slow down and you will not able to focus on anything. So please opt for wholegrain products such as brown cereals, brown pasta and wholegrain bread. If you take blueberries daily, you are preventing your brain from memory loss, and if you have short term memory loss, blueberry is proven to improve your brain’s health and delaying the symptom gradually. It is also easy to find, and you can use it as your daily supplement for brain’s health. Mackerel is full with fatty acids or also known as EFAs that can support good brain function ability and it is also preventing you to get diseases such as Alzheimer and memory loss. Fatty acids are naturally found in fish, such as mackerels, salmon and trout. Vitamin B can reduce the amount of homocysteine in the blood that can increase the chance to get stroke and Alzheimer. Eating food which containing Vitamin B to supply your daily need can prevent you from such health problems and diseases. Foods that high in Vitamin B are such as fish, papaya, squash, apricots, melons, cheese and eggs. You need to eat more tomatoes from now because it has a lot of lycopene which is an antioxidant that helping the brain to be free from radical damage that can affect the cells. It can prevent you from dementia, which is a development of Alzheimer disease. Tomato is very easy to grow too. You can grow your own tomato in your backyard’s garden to ensure you’ll have the lifetime supply of this healthy food. First is blueberry, and now is Blackcurrants, and why it is one of the brains foods? It is because the Vitamin C that can increase your mental agility. If you think orange can have enough Vitamin C for you, blackcurrants are actually offering you better because it contains more Vitamin C than an orange does. Love your veggies, and broccoli is actually good for your brain. It can help you to improve your brainpower and also the cognitive function. Tasty and great source for your healthy brain, you just can’t say no to this. Broccoli is easy to cook and suitable for any dishes. You can make your own broccoli salad, roasted chicken with broccoli, broccoli soup or steamed broccoli. If you take one handful of pumpkin seeds each day, you are providing yourself with enough amount of zinc. Zinc is very important to keep the brain healthy and improving your memory. At the same time, you are able to think positively and analytically because your memory is got improved. It is very useful for the students too. Brain food such as mentioned above is very easy to find, highly delicious and easy to prepare. The brain is like the center of your lifetime memory. So, to keep it functioning properly is very important for the rest of your life. So eat well for your brain and choose the right food for it. Blogger and Editor here on Healthtian and other Krafty Sprouts sites, I make sure things run smoothly as they should.